Toroi [Edo Tensei] is a shinobi from Village Hidden by Clouds which is lead by Raikage. Toroi [Edo Tensei] is an unique shinobi with Magnet Release. He was extremely skillful till he was reincarnated using Edo Tensei during the Fourth Shinobi World War. 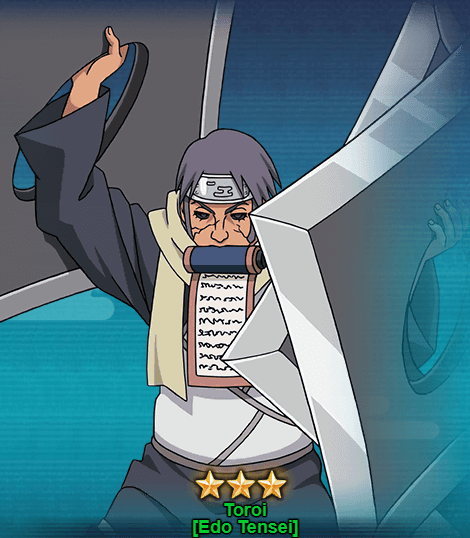 Let’s take a look at Toroi [Edo Tensei] abilities in Naruto Online game. Taijutsu & Ninjutsu Magnet Style – Conserving win Blades [Prompt]: Causes a selected unit to suffer from Paralysis, Immobile and Low Float. If the affected unit is already suffering from Paralysis, this unit’s Mystery Skill’s cool down time will be reduced to 1 round. Taijutsu Shuriken Attack: Attacks the opponent’s units in the front row and has chances of causing Repulse and 10 COMBO. Passive Ninjutsu Magnet Style – Magnetized Armor: Before each action of this unit, generates a Shield for this unit and a random Lightning attribute unit in your Lineup based on 20% of this unit’s Resistance base attribute. Can be triggered 2 times every round. The only way to get Toroi [Edo Tensei] is from the GNW (Great Ninja War) Treasure. You will need to draw at least 20-40 scrolls to get Toroi. If you’re lucky you might draw him with lesser seal scrolls.